This is Weekly Update #18 this time with some insight on the development progress of KRAXLN. After fixing the core design of KRAXLN, this week we continued to implement the basic features for the character progression and the items you will be able to acquire on your way up. Our idea for the character progression is to split it into three parts: 1. the direct improvement of the character stats, 2. the improvements through passive items and 3. the improvements through active items. For the direct improvements we have split the character stats into four parts: maximum strength (the main stat directly related to health and climbing), strength recovered per turn (how fast you can recover from slipping), damage (how hard you can hit enemies) and block (% chance to block all incoming damage). The player will be able to improve one of theses stats each time at the end of a level, if he gains enough experience. Experience will be granted through actions performed by the player. The basic idea for gaining exp is by climbing. Here we want to award the player for taking more risk, thus making climbing on difficult tiles more rewarding because he will be able to gain more exp the higher the difficultly on the individual tile is. In addition to climbing we will tie in exp to things like successful combat or being saved by a hook. In general we want to award more difficult situations with faster character improvement. For the passive items we want to integrate a simple shop system where the player will be able to purchase items that will passively help him to overcome more difficult parts of the mountain. An obvious example would be the item „Binoculars“ which increases the sight range of the player, making it easier to plan the next steps head. The shop itself will spawn inside the levels as an random event. Once reached you can accsess the shop and a random selection of items will be presented to you. 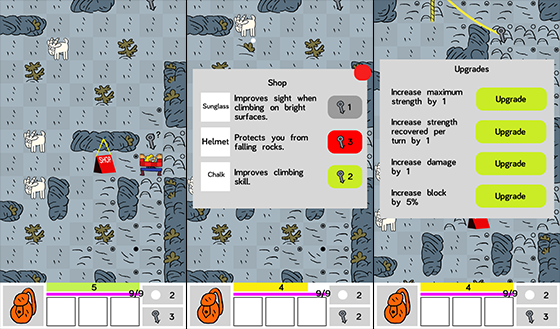 Shop items will be payed in climbing hooks, which was a feature we had planned back then in the 7DRL version already. Using climbing hooks as a currency improves the whole game a lot, because suddenly you really have to decide if you want to improve your character or keep them to make sure you have more chances to survive your climb. 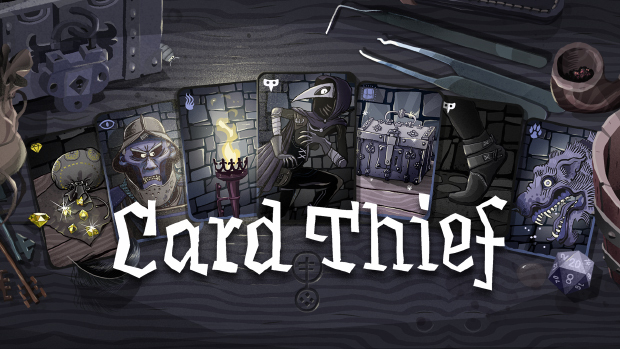 In addition to the „hook as currency“ design we added an additional new element to buying items. We added an inventory in form of a backpack. You can carry as many items as you want on your way up, but each item will decrease your max. strength by 1. This makes up for another interesting decision, because now you will need to value the improvement of the item against loosing strength which will lead to more interesting gameplay in general. The third part of the progression will be active items, which can be used by the player. For active items we have not yet made any designs, but it will be a temporary buff to the player or a one time special action. Active items will be bound to either dropping off monsters, thus making combat more interesting, or random loot in the game world. We plan on restricting the active items that can be carried around to 3 at a time. Next up is more designing for the passive and active items and integrating all the improvements those items will give the player. The two other big milestones we have ahead are designing more terrains and implementing more interesting/difficult enemies the player will encounter. This is it for this week! Have a nice Sunday!